Thangtong Gyalpo (Tib. ཐང་སྟོང་རྒྱལ་པོ་, Wyl. thang stong rgyal po) aka Tsöndrü Zangpo (Tib. བརྩོན་འགྲུས་བཟང་པོ་, Wyl. brtson 'grus bzang po) (1385-1509) was a famous Tibetan siddha who travelled extensively in China, Tibet and other eastern countries, built numerous temples and metal bridges and founded monasteries at Dergé and elsewhere. 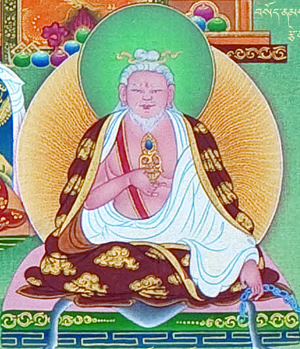 He is said to be an emanation of the mind aspect of Guru Rinpoche. Biography of Thangtong Gyalpo by Lochen Gyurme Dechen, གྲུབ་པའི་དབང་ཕྱུག་ཆེན་པོ་ལྕགས་ཟམ་པ་ཐང་ཐོང་རྒྱལ་པོའི་རྣམ་ཐར་ངོ་མཚར་ཀུན་གསལ་ནོར་བུའི་མེ་ལོང་གསར་པ་, grub pa’i dbang phyug chen po lcags zam pa thang thong rgyal po’i rnam thar ngo mtshar kun gsal nor bu’i me long gsar pa. Wood blocks of this biography have been carved at Thubten Chöling Monastery in Nepal under the inspiration of Dza Trulshik Rinpoche. Könchok Palsang and Dewa Sangpo (Dkon mchog dpal bzang and Bde ba bzang po), Bright Lamp: A Biography of Master Tangtong Gyalpo, Bla ma thang stong rgyal po’i rnam thar gsal ba’i sgron me. In Tangtong Gyalpo, The Collected Works of Grub chen Thang stong rgyal po (Grub chen thang stong rgyal po’i bka’ ’bum), vol. 2. Thimphu: National Library of Bhutan, 1984. Gyatso, Janet. "The Teachings of Thang-stong rGyal-po." In Michael Aris and Aung San Suu Kyi, eds., Tibetan Studies in Honour of Hugh Richardson. Warminster: Aris and Phillips, 1980, pp. 111-119. Dungtse Lhakhang, a temple in form of a chörten near Paro in Bhutan was built by Thangtong Gyalpo. The roof construction is made of iron. This page was last edited on 21 January 2017, at 06:15.